ď&#x201A;&#x161; If you are planning to the remove the old roof on your residential or commercial property and install a new one, you need to at least have an idea of the approximate amount that you are going to spend on this project. There are a lot of factors that go into what a new roof can cost, including the type of shingles you will choose and the size and pitch of your roof. 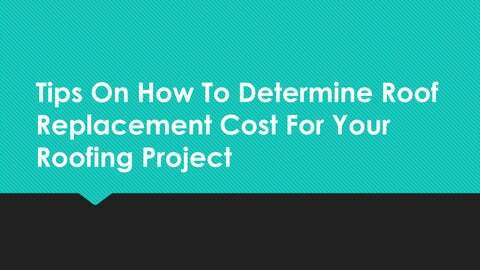 If you have never repaired or replaced your roof before, it can be difficult to estimate just how much money you should be budgeting for this project. Even though there are roofing calculators that you can use to determine how much the new roof will cost, you will still need to know other things you can do in order to get a more accurate estimate. ď&#x201A;&#x161; For you to get a basic idea of what your roof replacement cost will be, you can start by measuring your roof. If the idea of climbing up the roof and measuring it yourself freaks you out, it would be a good idea to hire roofing professionals. You can also get a general idea of the roof size from the ground or from inside your attic, but measuring it is a better idea. If your roof has a lot hips and dormers, you should seriously consider enlisting the help of professional roofers in order to reduce room for error. ď&#x201A;&#x161; You should not only measure the size of your roof, but also its pitch. The pitch is simply the angle of steepness of the roof that is usually measured over a 12-inch rise. It can be determined by measuring straight up 12 inches from the edge of the roof. The pitch has an effect on the number of shingles that you will need to finish your roof replacement work. The cost of replacing a steeper roof is more expensive because it is extremely dangerous to maneuver and tread on.